Fast, Free* & Easy Text Banking. *Message and Data Rates may apply from your mobile service provider. Your mobile device must have the ability to send and receive text messages. QNB Bank will never send unsolicited text messages. Text Banking messages will be sent from 226563. Text STOP to 226563 to stop all text messages to the mobile device. Not available for commercial customers. Q: Can I use QNB-Text 24/7 to get my account balance? A: Yes, as long as you have a cellular signal, a SMS eligible device and a phone plan. 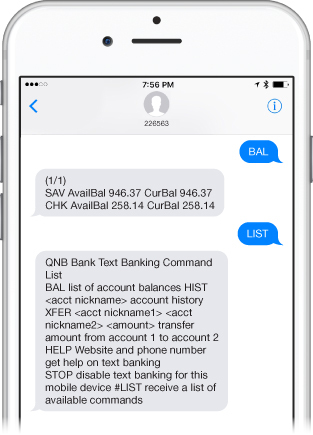 Q: How far back in my transaction history will I be able to see when I use QNB-Text? A: You'll receive the last 10 transactions. Q: How many phones can be connected to QNB-Text? A: Only one mobile number can be used for QNB-Text per user. Q: How do I set up nicknames for QNB-Text? A: After completing step #4 of the QNB-Text enrollment process shown above, you will see the following message: You have successfully enrolled in text banking. Before you can view your accounts on your text device, you must configure your accounts. Would you like to do so now? Click Visit Preferences. On the Account Preferences screen, click on the account for which you'd like to set up a nickname. Then, click the SMS/Text tab below the selected account. Make sure the SMS/Text Enrollment button switch is turned 'On'. Then, click the pencil icon next to the SMS/Text Display Name to change the nickname of the account for text banking messages. Q: Are text commands case-sensitive? A: No, commands can be sent in lowercase (bal) or all capital letters (BAL). Q: Is QNB-Text available for business customers? A: No, QNB-Text is only available for consumer customers at this time.